Reinforced for extra durability and longer life. 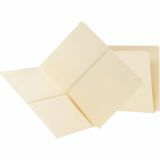 Smead Letter Size End Tab Pocket File Folders with Reinforced Tabs - The industry standard for efficient shelf filing, these end-tab pocket folders feature two handy pockets (5-3/4 x 9" each) on the inside that hold small or loose materials. Double-thick tabs deliver strength and durability. Straight-cut tabs offer plenty of space for labeling. 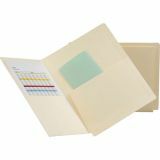 Folders are ideal for holding X-rays or protecting photos. Pockets open on the top and inside edge for easy filing and are sealed on the other edge. Heavyweight folders are made of 11 point stock.